You are here: Home / Tips and Tricks / Can I Unlock My Device From a Previous Owner’s Apple ID? Can I Unlock My Device From a Previous Owner’s Apple ID? So you purchased a used iOS device (iPhone, iPad or iPod touch) from somewhere other than Apple. In order for you to use this device, you have to make sure the device is no longer linked to the previous owner’s account (Apple ID). Without this, it is highly likely that you will not be able to use this device because you will not be able to activate it. This iPhone (or iPad) is linked to an Apple ID. Enter the Apple ID and password that were used to set up this iPad (or iPhone). (k……@macreports.com). This is a security feature that makes it very hard for someone to use or sell a stolen device. If you see this, you have to contact the former owner. Only the former owner can remove this. 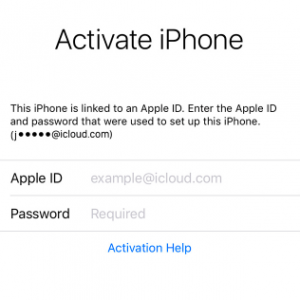 There are no other ways to bypass iCloud Activation Lock. If you call Apple, they will not help you. DFU restore will not fix this. This is because the previous owner’s Apple ID is securely stored on Apple’s activation servers and linked to his/her iPad or iPhone. The previous owner of this device can remove this lock. He or she can do this remotely by signing in to iCloud with their Apple ID. 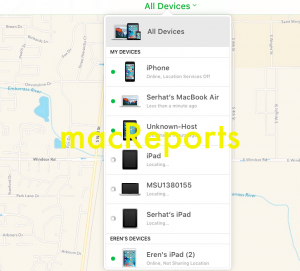 Simply use the Find My iPhone app on iCloud.com. Then go to Find iPhone > Select the device > Remove from Account. All of your devices linked to your Apple ID. Select the device you want to remove. Enabling Find My iPhone also turns on Activation Lock. Make sure that you visit icloud.com/activationlock. Here you can check if Activation Lock is disabled or not. You need to enter IMEI or serial number. Go to Settings > General > About to find these numbers. You can also locate these numbers on the back of your device. If it is on, you should ask your seller to erase the device (Settings > General > Reset > Erase All Content and Settings). Make sure you both are present. During the setup process, this iPhone or iPad may ask the previous owner’s Apple ID. Ask him / her to enter the password. If the owner is not present, you can also ask him /her to remove the lock by going to iCloud (see above). There are a lot of bad people. Some people may be trying to scam you by selling a stolen device. Note that the current owner may change the status. For instance, lets say you check the status before you meet with the seller, and the status showed “off”. The owner may change this by turning on Find My iPhone while he or she posses the device without you knowing. So be careful; check this right before you get the device. If you are unable to reset your Apple ID using this website, call Apple. They may be able to help you if you can persuade them that you are the owner by presenting them proofs e.g., receipts etc. In fact, I had this problem last week. My son created an Apple ID on his iPad and turned on Find My iPhone. Then later he forgot it. Since he did not remember anything (e.g. his answers to security questions), we could not use the Apple ID web site. But we called Apple, and they remotely unlock the device. This article explains how you can contact Apple for help. either, you will need information of previous owner or you will need to contact Apple or got to Apple store and tell them that you need to unlock mobile and there will be fee that you will need to pay. just because you cant do it does not mean it’s impossible there is a lot of ways you can bypass the activation,,e.g with tools like jailbreak , without tools by reconfiguring. Thats what happened to me! the guy i bought it from bought it from a guy on craigslist, and this guy then sold it to me an this iphone 6s i have is locked and idk what to do with it now since its locked. My ipad mini is locked out. I bought it in 2013, set it up with a new email account and then the email account was closed and deactivated. Now, even though I am the owner of the device I cannot get it reactivated because my account can’t be verified. I might as well throw it in the bin! Iphone 6 Showing Activation ID and PSW. Do you know if where is a way to find the owner and email of previous owner? How i could get this unlocked or just return to the owner ? I have bought iPhone 5 used one from my cousin in Saudi Arabia around 3years before.it was running very nicely.but because of my cousin I’d I can’t update app.for updates need psd and I called my cousin for psd but unfortunately he has forgotten pad.i reset through I tunes but now showing activation I’d and psd.we now about I’d but forgot pad.how can we get psd for that I’d.need help.Javed Sulaiman. My phone is reset and owner is out of city and main problem is email and password is lost it so please help me…. I bought an iPhone and she is the previous owner but doesn’t know the icloud password. It has an activation lock and I have no idea what to do or how to get rid of it.. help? 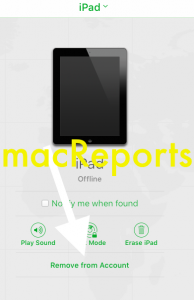 My ipad is reset and owner is out of city and main problem is apple id and password is lost it so please help me…. Same issue. For this reason alone, the iCloud lock is ridiculous. It hurts paying customers as much as the thieves. This is going to cause Apple to lose me as a long time customer. The phone I have that my son refuses to give me the log in to, is useless garbage that I paid $800 for. Apple you are really hurting customers with this. The police are there to handle thieves. Sell the phones. Stop being police. I am going back to android. At least they cost less and If I get locked out, I dont lose a grand. I brought Iphone 6 plus from other website. I asked previous owner about apple id and password also activation lock. The owner previous not give me information. What i do with iphone 6 plus. Please Please Please help me as so as possible. We have the same problem do you unlocked yours? Maybe “non whites” shouldn’t buy a phone off the street, more than likely stolen. I got my iPhone from a deceased friend, with an icloud lock, asking for user iD and password. Please can you help me unlock it. Your best bet would be to contact apple with proof of death (death certificate) and proof that the iphone was given to you (maybe copy of the will/statement from the executor of the will, etc). Even then you might be hard pressed to do so. It might be easier to try and get access to the email address used for the account and hope you know enough answers to obscure questions to be able to reset the password. I’ve heard of apple being given court orders to unlock an account/iphone and flatly ignoring it while stating “policy” is why they won’t. Frankly I think they don’t want to unlock what can only be described as the thin end of the wedge. If they start it, who knows what’ll happen if others get to cite it as an excuse to get an unlock on even shakier grounds. Good luck. I found one of iphone 6S, but i cannot use it because iphone was lock by owner, can you help me to unlock iphone??? Please help me to unlock this iphone sir. I purchased an iPhone 7 plus that is is asking for the apple id and password (activation locked). Is there a way to find the former owners email so that I can try to reach out to them and ask them to remove this for me? Your help would be much appreciated. I got my ipad from my grandpa, when i opened it and reset it, i dont have the apple id or password because he is dead and noone in my family knows the password. so what do i do. Do you have an invoice? I have a got a ipad from one of my friend’s friend. It is now showing activation lock please enter the apple id and password. Now I dont have any contact with that friend. So what should I do. Please help me out in this. ibought an iphone 5S but when i reset it it can’t be done because this already reported lost or stolen.then the girl selling to me i contacted her but she already blocked from online. pls.. help me how to activate this phone. this is the EMEI#351983064846548 pls help me to activate this iphone pls……..
hello please i bought a macbook air from someone and sent it with a 4pine icloud code on. i cant use the macbook, plese can you help? I purchased a second hand mini ipad that is asking for the apple id and password (activation locked).I have tried to call the phone number on the screen but it was saying invalid number. I have searched on line to find the country’s code but was unsuccessful. I need your help on what to do next. i want to know how should i can activate unlocked ID while i am using in 2 phone one phone pay bill is available for another phone don’t have, its possible to deactivate unlocked id in the second phone as per first iPhone pay bill, please reply, now both phone is working in good condition. Your prompt reply regard the above would be highly appreciated. I have an iPhone 6 with icloud activation lock…I do not know the previous owner who is from another continent…how do I remove it…??? is it possible update ios version on lock icloud device via dfu? Hi there. iActivate is a perfect program for users who have an activated iPhone or iPad mini with Apple ID but who have forgotten the password. The tool can bypass Apple ID account. This will NOT bypass iCloud Activation Lock. Only works for MDM remote management (company) lock! Don’t waste your time. iCloud activation lock CANNOT be defeated. my iphone 6s activation lock.. USELESS!!!!! Nowadays, many people are selling iPhones, iPads in estate sales. The original owner is dead. We need to know how to unlock these devices. Haven a find iphone s6 and there is an icloud activation lock account so please what should I do to do remove those icloud activation lock? iphone 5s only show in apple logo what a problem how to solved. please share any idea &`breaking software linkes. Trying to unlock my kids iPhone, and nothing is working, can anyone help me with this please. So I have an iPhone 6 Plus that I haven’t used in 3 years and forgot the passcode. The phone is now disabled and says connect to iTunes. I don’t remember any of it because it’s been so long plus it’s deactivated. Can I enable my phone without a computer? I have an old 4s given to me. I don’t want to use it as a phone, but as an iPod. I use Android as phone. Mac for computer. Broke the screen of my iPod touch. I did a recovery, loaded music via library but I can’t see why I need an apple id just to be used as a music player. Don’t want to make calls. My cousin gave me an iphone 6s plus and the phone has an icloud account and the previous person does not remember the pw. I reseted the phone and in order to activate it i need the pw. Am i still able to unlock the phone??? Please anyone helpp!!! i bought an iphone 8 on hand,it happen to be icloud locked i have the owner icloud email and his phone number but he doesnt want to unlock it for me,what should i do.is there any way i can reset it using the email and phone no? I bought my first i phone 4 from a Chinese gentle man 4 days ago but have not been to use it because of the id and password. Honestly we were unable to complete all the changes needed to unlock the phone because he didn’t know English and am poor at Chinese. He helped change settings in Chinese to English but we forgot the id. I can’t get him now bse phone number he gave me to keep untouched hasn’t helped. He left me a copy of his passport since had long lost his receipt. If I submit the details of his passport to confirm genuine transfer of ownership can I be helped? I have been trying to give an old iPad to a friend. I have reset it to factory settings. I have deleted the iPad from iTunes, deleted it from the iCloud, and still when she tries to set it up, it says that the iPad is blocked and I need to enter my Apple ID and password. But then the Apple ID and password aren’t recognized?